This chapter reviews the biology of human reproduction, first in the “normal case” of women in regular cycles, and then detailing the specific ways in which breastfeeding affects female fertility. Because direct hormonal monitoring forms the cornerstone of the Marquette Method system, this chapter emphasizes in particular the interrelated functions of six female reproductive hormones that regulate fertility in breastfeeding women: prolactin, estrogen, progesterone, gonadotropin-releasing hormone (GNrH), follicle stimulating hormone (FSH), and luteinizing hormone (LH). No one method of NFP is the perfect choice for all women, all of the time. This chapter helps couples make an informed choice about which method will be the best fit for them during the breastfeeding transition. It reviews the similarities and differences between NFP methods’ approaches to the breastfeeding transition, reviewing low-tech calendar formulas, the Lactational Amenorrhea Method (LAM), mucus-based methods, symptothermal methods, and the Marquette Method, which is a high-tech calendar method. The chapter then explains how natural family planning effectiveness rates are studied by introducing medical research concepts of perfect use and typical use. This chapter then presents and compares the published perfect and typical use effectiveness rates for each NFP method for breastfeeding, postpartum women. Practicing the Marquette Method correctly means operating “the technology” of the method – the Clearblue monitor and test sticks – correctly. This chapter begins explaining the science of the method – revealing how the test sticks work, how the monitor reads the sticks, and what the fertility readings mean. This chapter also reviews the foundational research that helped the Marquette Method researches to choose the Clearblue line of fertility monitors as the key technology on which to develop their path-breaking method of NFP. 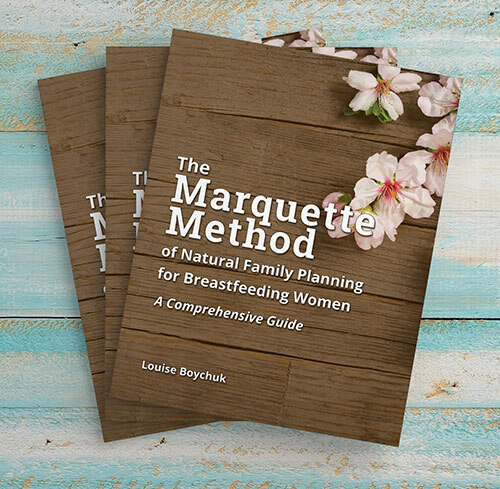 The chapter then dives into the specifics, providing essential information that enables Marquette Method’s breastfeeding users to confidently use their monitor correctly. It identifies the various ways in which Marquette’s use of the monitor deviates from the instructions outlined in the Clearblue instruction booklets, and clears up any confusion Marquette users may have about how to operate their monitor correctly to ensure accurate test results, every time. Charting is an essential element to a couple’s practice of the Marquette Method. A woman who charts is mapping her hormone levels throughout the breastfeeding transition. This chapter makes the case for accurate and complete charting, and introduces Vitae Fertility’s custom charts. Parts III and IV of this manual are each, in a sense, “books within a book.” Part III, “Marquette Cycle Zero Breastfeeding Protocols” includes everything couples need to know to practice Marquette’s cycle zero protocols effectively. It begins with chapter which provides day-by-day instructions to testing for both the 10-Day and 20-Day Breastfeeding Protocols, tailored to couples using either the monochrome or touchscreen monitors. The following chapter explains how women chart in cycle zero using Vitae Fertility’s paper charts. The third chapter of Part III explains how to use Marquette’s algorithm in cycle zero either to avoid or achieve pregnancy. The final chapter of Part III, “Following Up with Your Instructor,” provides instructions on how and when my clients should get in touch with me, detailing the specific circumstances that some women face in cycle zero when professional, personalized advice is always advisable. Part IV of this manual focuses exclusively on the Marquette Method Breastfeeding Return to Cycles Phase. Dividing this manual along the lines of Marquette’s division of the breastfeeding transition allows women who start testing after their return to cycles to skip over the cycle zero protocols, which do not apply to them. In structure, Part IV follows the same organizational structure, but the information pertains to the subsequent phase of the breastfeeding transition. It includes chapters dedicated to the day-by-day testing instructions, charting, achieving or avoiding pregnancy in the breastfeeding return to cycles phase, and when to follow-up with your instructor.